UPDATE: Nic Riccardi reports that Hick paid for his PR firm from his own funds. Spendy. 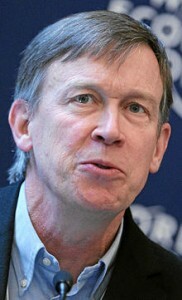 No word on who was governing Colorado while he was campaigning for Veep. As a number of sources have reported over the past two days, John Hickenlooper hired a New York PR firm to promote his effort to be selected as Hillary Clinton’s running mate. So far, the Hickenlooper camp is mum on the name of the firm that was hired. Additionally, sources say that no NY firm could be had for such a project for less than $15,000 per month. Who was hired, and who paid for it? Furthermore, how much time did Hickenlooper spend in DC promoting his book and running a shadow campaign for vice president? As we said earlier this week, Politico wrote about the governor’s “near constant presence in Washington” this spring. If Hickenlooper spent his own money on this project, that is one thing. But if he was back east campaigning without taking vacation time and not governing, that is another thing. And if he was using political funds to manager this process, that ought to be disclosed as well. Failure to do so makes Hickenlooper actions just another example of what a joke the Democrats are playing on the electorate with all of their talk about transparency in government.